Skeptical people have always wondered whether or not we are alone in the universe. The Truth is that extraterrestrials have visited our planet long ago, and they even have contacted with some countries secretly, but these governments won’t acknowledge the existence of UFOs officially. 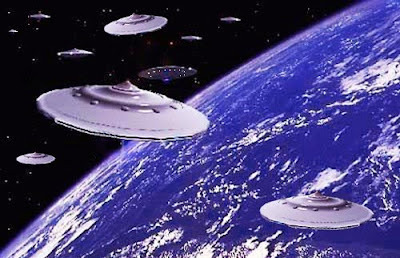 However, before the end of this century, a massive extraterrestrial contact will take place on Earth. That day will be historical for mankind and not even the most recalcitrant skeptic will deny the existence of UFOs anymore. Interlocutor: Do Skeptics continue with their stubborn posture denying the existence of UFOs and the spiritual world? Ruanel: Correct, and they also have phobia against all that is related to esotericism and they continue with their truth. In some cases there are skeptics that become directly in fools when they deny what reality is. Interlocutor: In the case of skeptics they must have ego and engrams without any doubt, otherwise one cannot understood,- and excuse me the term-, such imbecility. Interlocutor: What I am not sure of is if they act in bad faith, or it’s simply their stupidity. Ruanel: Don't think so. There are skeptics that make fun of people they attack verbally they demean not only to your group but also to other groups. They take as irrational to all those who believe in everything related to the spiritual world. Ruanel: Well, then I’m off the hook. (laughs). You already know that fortunetelling doesn't exist. Interlocutor: Yes, of course, but I’m referring to time travelers, they should have revealed something. Ruanel: I haven’t ran into someone, Have I? (laughs)… There is a phrase said by the Dear Absolute who has created us all and to him we go again, a while ago, through the mouth of this vessel: "The planet Sun 3 is a gigantic kindergarten, where these children, these small children, these lads that have so much knowledge to paint the best paintings, to build the best architectural works, they also produce killing machines, polluting machines to destroy to their own species. They destroy animal species. There are hundreds of extinct species of fish. They destroy the drinking water. Imagine, for example, that you as a spirit have embodied in another world where all the beings help to each other and you come to this planet, and you see from your space ship what is happening in Sun 3, what would be your reaction? Interlocutor: Well, at least my morale would be very low. Interlocutor: But returning to the question Did a time traveler make the smallest reference concretely to this matter, the massive extraterrestrial contact? Interlocutor: And when the human being will grow up so that that contact takes place? When somebody asks me that, I always respond that many millennia probably pass before something like that happens. Ruanel: No, no, then I correct you. The idea of some extraterrestrials I contact myself with, I refer to their thetans, it is that before this century ends. Ruanel: Not millennium, but century, It must be a contact. That’s the idea of some aliens from closer solar systems. Interlocutor: See? How with my cleverness I could coax the secret out of you? (laughs). Interlocutor: It’s a joke, Master… (laughs)... come on Master, take a chance. Didn’t a time traveler reveal the date of that massive contact? Ruanel: I will respond you in a very coherent way: Every time traveler drags to his thetan. His thetan has knowledge of that future time. His thetan is not at all times with “the curtains low”. Although we respect his free will. Understand that free will is respected when the thetan has the conceptual curtain low. If he doesn't have his conceptual curtain low, we can perfectly perceive his thought, and then we take out from him all the information. Interlocutor: Concretely then, you know for sure when that future contact will take place. Ruanel: We know perfectly the date, the day and the hour. Interlocutor: Then you know it? Ruanel: Of course we know, because we can read the thought of the thetans of time travelers! Ruanel: No, it is not an agreement with Eon, because the Absolute allows our free will. If I, at this time disclose that information I would not be breaking any law because the Absolute doesn’t forbid anything. How will he forbid since he has given us his Love and Free Will? Interlocutor: Certainly, I had forgotten the issue of free will. Ruanel: We don't say it because it is a matter of ethics, because it is not the moment, nothing else. We can say what should have happened and didn't happen, as the dear and sublime Master Johnakan said: we were not prepared for the atomic fusion and it was made in the year 1938, when it should have been made in the year 2100. Interlocutor: That’s clear. If I requested a date simply as a speculation? I ask it because at some time Eon gave an answer in that way. Ruanel: As a speculation, there is a number that says 2070. Interlocutor: Well, that is already something, although I won't be here to see it. Ruanel: How you won't be? Ruanel: Even you can be one of those aliens, if you embody in that planet that will make the massive contact. Interlocutor: You’re right, Master, I didn’t think about it. Ruanel: There is an earthly phrase that can be applied here: "Life goes around"
Interlocutor: Yes, I understand what you mean. Before to move on to another topic I’d like to ask if Carl Sagan's article “The Burden of Skepticism” has caused a lot of damage. I admit that this article drives me crazy and causes me irritation. Ruanel: Sometimes The skepticism of the other "hits" the ego of the other. This is my answer. Interlocutor: I understand what you mean, but concretely the question is about the damage that this article has caused. Notice that it’s spread all over the internet. Ruanel: Yes, it has caused a lot of damage, as well as it has made a favor to their investigations. Anyhow, any middlebrow being would acknowledge… And I hope that skeptics know that if a Galaxy has around 100000 and 300000 million stars, even though there is an inhabited world each million stars, there would be 300000 inhabited worlds. Interlocutor: That’s clear, but the gist is that skeptics in general accept that there are other inhabited worlds, but they deny that extraterrestrials have been able to arrive until here. Ruanel: I would tell to the skeptics that, at this time if a Stone Age man saw a computer, he would not understand what it is or what the images in the monitor represent. If a terrestrial man of the year 2000 saw beings of 10000 years from the future, he wouldn't understand their energy field either, he wouldn’t understand how they travel through the Milky Way… Systems of Energy, of energy branches between the walls of matter and dark energy and the walls of common matter, these are topics I don't want to talk about because they would not understand, neither you nor those who read this. Interlocutor: I Do realize what you mean, but the skeptics don’t listen because they only listen to themselves. By the way, In which spiritual plane is Carl Sagan? Ruanel: He is not that bad, He is in the plane 3.9, at one sublevel to arrive to a Mastery Plane, because he has a noble spirit and he seeks to research, simply the concepts he had were wrong when he was incarnated, but he was not hostile. Interlocutor: Did he lower from plane when he disembodied or he returned to the same place he was? Ruanel: He lowered from plane because in some things he was very stubborn, besides he dragged roles of ego and with roles of ego one cannot be in the Planes of Light. This entry was posted at Thursday, September 17, 2009 and is filed under Extraterrestrials . You can follow any responses to this entry through the .